Once again the wilderness speaks and perhaps someone will someday listen. I have injected several additional comments in the text. I personally have become much more radical in my thinking vis a vis the economic system. Micro finance informed us that the same tools can be shipped downstream to the individual and the natural community. A big part of my emerging paradigm secures the definition of the natural community and its financial integrity independent of the greater State, but directly attached to the land. I suspect that this is very powerful and will rapidly dominate the global economy over the next few generations. The greater State remains important in such a paradigm but the people themselves are free to partake or not as their lives demand independent of the State. The organizing power of the state is applied to tasks for the greater human good supported by the people affected and the communities affected. This is no small task and will create the whole future of human existence on Earth and among the Stars. In the meantime, this article is on the right side of history. As Congress struggles through one budget crisis after another, it is becoming increasingly evident that austerity doesn't work. We cannot possibly pay off a $16 trillion debt by tightening our belts, slashing public services, and raising taxes. Historically, when the deficit has been reduced, the money supply has been reduced along with it, throwing the economy into recession. After a thorough analysis of statistics from dozens of countries forced to apply austerity plans by the World Bank and IMF, former World Bank chief economist Joseph Stiglitz called austerity plans a "suicide pact." Congress already has in its hands the power to solve the nation's budget challenges - today and permanently. But it has been artificially constrained from using that power by misguided economic dogma, dogma generated by the interests it serves. We have bought into the idea that there is not enough money to feed and house our population, rebuild our roads and bridges, or fund our most important programs - that there is no alternative but to slash budgets and deficits if we are to survive. We have a mountain of critical work to do: improving our schools, rebuilding our infrastructure, pursuing our research goals and so forth. And with millions of unemployed and underemployed, the people are there to do it. What we don't have, we are told, is just the money to bring workers and resources together. But we do have it - or we could. Money today is simply a legal agreement between parties. Nothing backs it but "the full faith and credit of the United States." The United States could issue its credit directly to fund its own budget, just as our forebears did in the American colonies and as Abraham Lincoln did in the Civil War. Any serious discussion of this alternative has long been taboo among economists and politicians. But in a landmark speech on February 6, 2013, Adair Turner, chairman of Britain's Financial Services Authority, broke the taboo with a historic speech recommending that approach. According to a February 7 article in Reuters, Adair is one of the most influential financial policymakers in the world. His recommendation was supported by a 75-page paper explaining why handing out newly created money to citizens and governments could solve economic woes globally and would not lead to hyperinflation. In the US monetary system, the only money that is not borrowed from banks is the "base money" or "monetary base" created by the Treasury and the Federal Reserve (the Fed). The Treasury creates only the tiny portion consisting of coins. 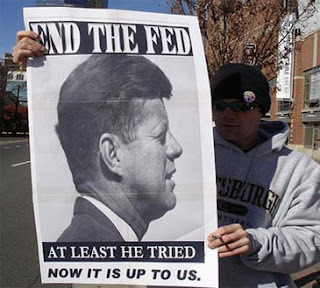 All of the rest is created by the Fed. Despite its name, the Fed is at best only quasi-federal and most of the money it creates is electronic rather than paper. We the people have no access to this money, which is not turned over to the government or the people but goes directly into the reserve accounts of private banks at the Fed. [I]n a modern monetary system - fiat money, floating exchange rate world - there is absolutely no correlation between bank reserves and lending. . . . [B]anks do not lend "reserves". . . . Whether commercial banks let the reserves they have acquired through QE sit "idle" or lend them out in the internet bank market 10,000 times in one day among themselves, the aggregate reserves at the central bank at the end of that day will be the same. Banks do not lend their reserves to us, but they do lend them to each other. The reserves are what they need to clear checks between banks. Reserves move from one reserve account to another, but the total money in bank reserve accounts remains unchanged, unless the Fed itself issues new money or extinguishes it. The base money to which we have no access includes that created on a computer screen through quantitative easing (QE), which now exceeds $3 trillion. That explains why QE has not driven the economy into hyperinflation, as the deficit hawks have long predicted, and why it has not created jobs, as was its purported mission. The Fed's QE money simply does not get into the circulating money supply at all. What we the people have in our bank accounts is a mere reflection of the base money that is the exclusive domain of the bankers' club. Banks borrow from the Fed and each other at near-zero rates, then lend this money to us at 4 percent or 8 percent or 30 percent, depending on what the market will bear. Like in a house of mirrors, the Fed's "base money" gets multiplied over and over whenever "bank credit" is deposited and relent; andthat illusory house of mirrors is what we call our money supply. We Need Another Kind of "Quantitative Easing"
The quantitative easing engaged in by central banks today is not what UK Professor Richard Werner intended when he invented the term. Werner advised the Japanese in the 1990s, when they were caught in a spiral of debt deflation like the one we are struggling with now. What he had in mind was credit creation by the central bank for productive purposes in the real, physical economy. But like central banks now, the Bank of Japan simply directed its QE firehose at the banks. Werner complains: "[A]ll QE is doing is to help banks increase the liquidity of their portfolios by getting rid of longer-dated and slightly less liquid assets and raising cash.... Reserve expansion is a standard monetarist policy and required no new label." The QE he recommended was more along the lines of the money-printing engaged in by the American settlers in colonial times and by Abraham Lincoln during the American Civil War. The colonists' paper scrip and Lincoln's "greenbacks" consisted not of bank loans but of paper receipts from the government acknowledging goods and services delivered to the government. The receipts circulated as money in the economy and in the colonies, they were accepted in the payment of taxes. The best of these models was in Benjamin Franklin's colony of Pennsylvania, where government-issued money got into the economy by way of loans issued by a publicly owned bank. Except for an excise tax on liquor, the government was funded entirely without taxes, there was no government debt and price inflation did not result. In 1938,Dr. Richard A. Lester, an economist at Princeton University, wrote, "The price level during the 52 years prior to the American Revolution and while Pennsylvania was on a paper standard was more stable than the American price level has been during any succeeding fifty-year period." The threat of price inflation is the excuse invariably used for discouraging this sort of "irresponsible" monetary policy today, based on the Milton Friedman dictum that "inflation is everywhere and always a monetary phenomenon." When the quantity of money goes up, says the theory, more money will be chasing fewer goods, driving prices up. True, today these additional workers might be in China, or they might be robots. But the principle still holds: if we want the increased supply necessary to satisfy the needs of the people and the economy, more money must first be injected into the economy. Demand drives supply. People must have money in their pockets before they can shop, stimulating increased production. Production doesn't need as many human workers as it once did. To get enough money in the economy to drive the needed supply, it might be time to issue a national dividend divided equally among the people. Increased demand will drive up prices only when the economy hits full productive capacity. It is at that point, and not before, that taxes may need to be levied - not to fund the federal budget, but to prevent "overheating" and keep prices stable. Overheating in the current economy could be a long time coming, however, since according to the Fed's figures, $4 trillion needs to be added into the money supply just to get it back to where it was in 2008. Taxes might be avoided altogether if excess funds were pulled out with fees charged for various government services. A good place to start might be with banking services rendered by publicly owned banks that returned their profits to the public. The Federal Reserve has lavished over $13 trillion in computer-generated bailout money on the banks and still the economy is flagging and the debt ceiling refuses to go away. If this money had been pumped into the real economy instead of into the black hole of the private banking system, we might have a thriving economy today. [W]hy do [we] consider the banks to be the holy churches of the modern economy? ... The theory that you have to bail out banks is a theory about bankers enjoying for their own profit the success and then letting ordinary people bear the failure through taxes and austerity, and people in enlightened democracies are not going to accept that in the long run. We are waking up from the long night of our delusion. We do not need to follow the prevailing economic orthodoxies, which have consistently failed and are not corroborated by empirical data. We need a permanent money supply and the money must come from somewhere. It is the right and duty of government to provide a money supply that is adequate and sustainable. It is also the duty of government to provide the public services necessary for a secure and prosperous life for its people. As Thomas Edison observed in the 1920s, if the government can issue a dollar bond, it can issue a dollar bill. Both are backed by "the full faith and credit of the United States." The government can pay for all the services its people need and eliminate budget crises permanently, simply by issuing the dollars to pay for them, debt-free and interest-free. You can intervene in the nation's budget debate by watching a Roots Action video and writing your Congressional representatives and the president here.